Spendor arrived on the scene at the beginning of the 1970s, bringing a strong BBC heritage along with a number of interesting innovations that its competitors arguably didn't fully appreciate. One of the most significant among these was a radical approach to enclosure design. The theory goes as follows: building an exceptionally stiff structure might serve to reduce the amplitude (ie relative loudness) of cabinet vibrations, but it also increases the frequency at which they occur, so that the enclosure coloration tends to occur in the midband where human hearing is most sensitive. The alternative Spendor approach, originally inspired by the BBC's desire for accurate speech monitoring, is the 'thin wall' cabinet approach, backed by heavy damping pads, which pushes the cabinet wall vibrations down into the bass region where they're considered less intrusive. Although that technique sounds simple enough, in fact these enclosures are rather harder to make than the thicker variety. The Classics are just one of Spendor's ranges and make every attempt to recreate the physical characteristics of those 1970s' models, albeit using more modern materials and manufacturing techniques. This /3R2 variation is the latest version of the SP2 and is the middle model among five Classics. The shape, size and presentation are all nostalgically similar to its 1970s ancestor, so it's a quite large two-way standmount, finished in cherry veneer on all six faces and with the baffle and grille recessed behind a 'picture frame' formed by extending the enclosure sides. 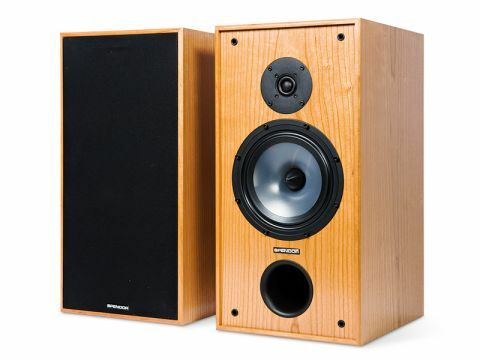 Set halfway up (or down) the front, in between a large port and the tweeter, the bass/mid driver has a 210mm frame and a transparent plastic cone 150mm in diameter. The tweeter is a relatively new and usual design, used in several recent Spendors. Described as a '22mm wide surround' type, in fact the central dome measures around 19mm in diameter, while dome-plus surround totals 34mm. Twin high-quality socket/binder terminal pairs are mounted directly through the rear panel, feeding silver-plated copper wiring and a crossover network with highgrade components. We weren't all that surprised when the SP2/3R2 comfortably and unanimously topped the listening test rankings. We'd already given the various models a quick listen while carrying out the measurements necessary to determine where best to site them and that had provided strong clues that the Spendor would do well. The paeans of praise recorded by each panelist actually became a little repetitive, at least two individuals reckoning that this was a speaker they could happily live with, especially in the way it handled all six very different tracks without fear or favour. This is also a speaker that knows how to rock. The bass could perhaps be tauter, tighter and punchier, but the overall timing and coherence is excellent, which is what matters most. Some potential purchasers may be put off by this speaker's old-fashioned presentation, but I daresay others will welcome the nostalgic appearance. And anyone who takes the trouble to listen will surely appreciate the sonic superiority that justifies the thin-wall enclosure approach.